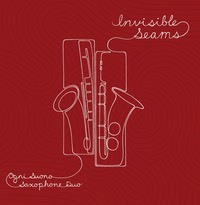 The title Invisible Seams was inspired on a microscopic level by our sound as a duo. Whether our musical material is hocketed, layered, transparent, or thick, we strive to balance our individuality as musicians with the desire for a unified blend. Broadly, the title characterizes the differences we find in the world around us, our travels as a duo as well as the relationships we have formed along the way. All works recorded on this album were commissioned by Ogni Suono.